“It looks like a science lab in here!” Ollie noted, but he didn’t seem surprised. We’ve devoted a whole testkit area in our house and the shelves are already stuffed with my ‘tests’; we both know the madness has only just begun. I had pulled out every type of pH strip I had purchased and they were on the table, in between an ocean testkit returned yesterday and some secchi disks that arrived today. I had a good reason to test… We are creating 17 citizen science testkits for Ontario150, Canada’s 150th birthday! This past summer, we trialled our ‘Ocean Explorers‘ testkits, where we used teststrips or inexpensive pH meters and sent people to the oceans. I had a hunch, and told our volunteers, that the strips we gave them were pretty good. But a real scientist needs some proof. 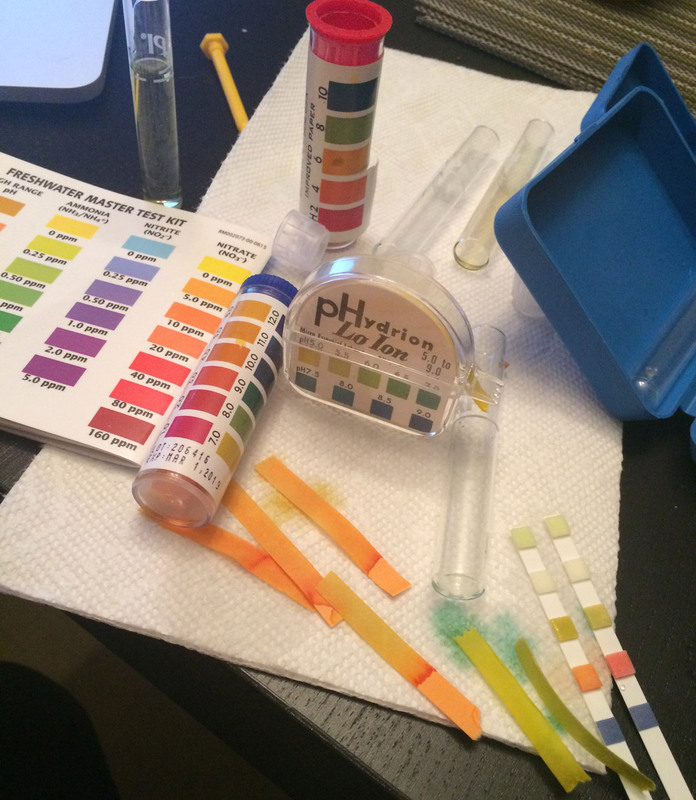 One of my pet-peeves was the lack of knowledge about what’s the best way to test pH. I mean, pH! That should be easy, right? Turns out it’s not. I spoke with a few scientists (good friends at Ottawa Riverkeeper, RVCA and MVCA), but they’re used to using the good stuff: properly calibrated multi-thousand dollar probes. When I enquired what they thought about the citizen scientist version, most were cool with teststrips, which was great news! But, none could recommend a type or brand. Next, I googled. Reviews on the various strips were all over the place. Some loved them, others thought they were garbage. I wasn’t going to find the answers there. I needed to run a test! 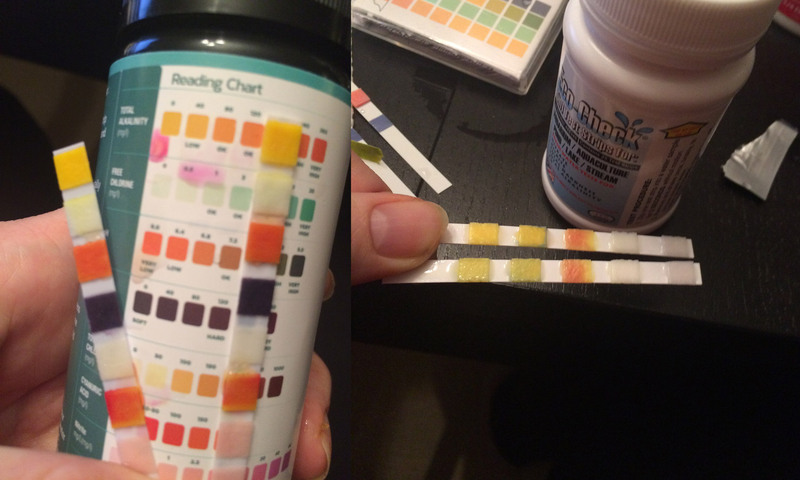 I’m in Canada, so there’s less types of test strips available for pH monitoring than in the U.S. It’s also winter, so local stores don’t stock em. Everything is frozen here too, so I couldn’t pull it from the lake or river. Also, this caveat: it is by no means an exhaustive test. I have 15 tests, and I took 2 readings at the same time in two different samples to try and be as consistent as possible. Unfortunately, I do not have an expensive pH probe. But I do have 2 tests that I have compared against a good expensive one before. The first one is the API Freshwater Master Kit (pH and high-range pH) and the second one are these yellow pH meters that I calibrated right before conducting the test. These should fit within the range of the test strips and the range of most freshwater systems. Good question. I would love to. BUT, the API Freshwater Kit is dealing in chemicals, and isn’t great for inexperienced people in the field. I dropped some of the acid on Jordan once trying to do a titration on a rocking boat. It’s just not the right thing for entry level citizen scientists. Plus they are pricey! 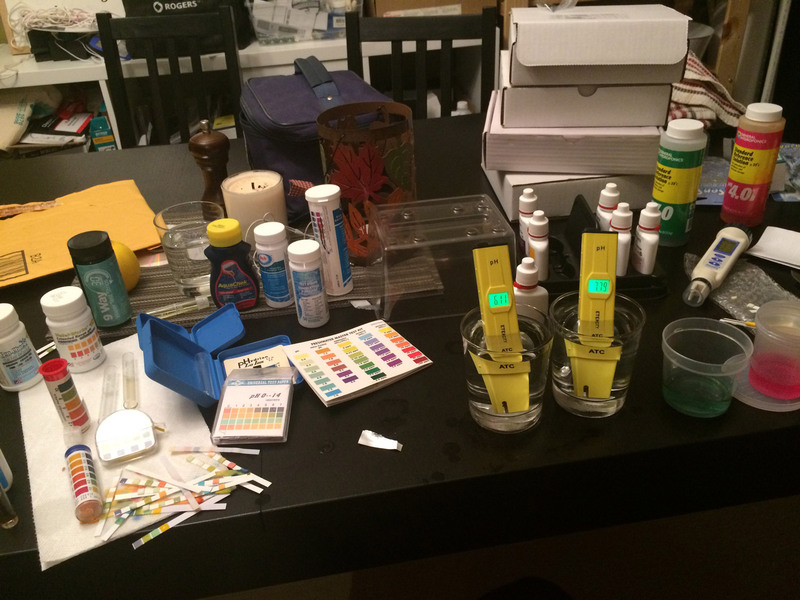 As for the cheap pH meters, we had high hopes. We bought a bunch, leant them out. Problem was, some of them didn’t hold their callibration well, and these ones have a ‘screw’ to calibrate it. That means they’re not waterproof. And it doesn’t matter how many times I say, “Don’t submerse it completely!” People do it without thinking, or get hit by a wave, and it’s ruined and they feel bad. We want people to enjoy testing waters, so back to teststrips! I’ve defined four different types of teststrips and talk about how they performed. Without fail, the strips in each category tended to do the same. I’m not going to spend much time here…. Maybe litmus can tell you if it’s alkaline or acid, but for those values right close to the center between 6-8, these did incredibly badly. Most of them didn’t change colour at all, and if they did, it definitely didn’t give me anywhere near the definition I needed to say anything was accurate. A couple of them read ‘5’ and the highest reading I got was ‘maybe between 6 and 7’ when it should have read closer to 8. The fancy LoIon green tape in its fancy dispenser failed terribly. It read 5.5 for both. They were also incredibly likely to get wet, since I had to tear one off a pack… and if you’re out in the field, that’s impossible. I had high hopes for these: You test on two little spots at the same time, and in theory, that means that if the colours are close together, you can get more accurate. I actually got these in the mail today. The other ones I already had always read 5 or 6, but I thought maybe they had just gotten wet. Nope! Turns out this one isn’t very good either! Read at 5 and 6.25. Nice that they actually looked different from one another, but they’re not accurate enough for me. For a single factor test, they weren’t that cheap either. I have loads of these ones. They’re advertised as made for ponds and lakes, or maybe drinking water. I buy them, and every time, I’m so sad, kinda like when you buy things off infomercials, you think, “This is EXACTLY what I need.” but then they just don’t work and you put them away in a box. They’ve all got different protocols to follow, but that’s not the problem, I don’t mind a bit of counting. Often there’s a ‘waiting time’ when you may or may not shake off excess water. You end up with a smear of colours, impossible to fully know which one it is, and then the colours mingle, or only partially change. Also, they don’t seem accurate, and the ones for ponds are still giving me readings of 5, or is that 8? Others have so many parameters, and the readings are so small, there’s no way to do any sort of accurate reading and they still smudge like no one’s business. Ecocheck, which I had the highest hopes for, looked exactly the same for both samples… very worrying. On the left, there’s 9 things to compare against and it’s smearing everywhere. On the right, the colours aren’t solid… what is the right one? Both didn’t give accurate readings. I know, this post was getting really depressing, and maybe you thought you could never use test strips again. But, there’s great news: pool and spa test strips are by far the nicest, easiest to read. My favourite, HTH, which can be purchased at Walmart and Home Hardware, doesn’t even require counting… just dip and check immediately! My second favourite, Aquacheck, found at Canadian Tire, only requires counting to 15. I like the container for the Aquacheck the best… you don’t reach in to get one out, it’s got a little hole to let one out at a time. I found out that HTH does one like this too, but haven’t managed to source it here in Canada yet. Other brands did a fair job, but weren’t as accurate or clear. Both were under $20… expect between $13 and $17 for a container with 50 in it. 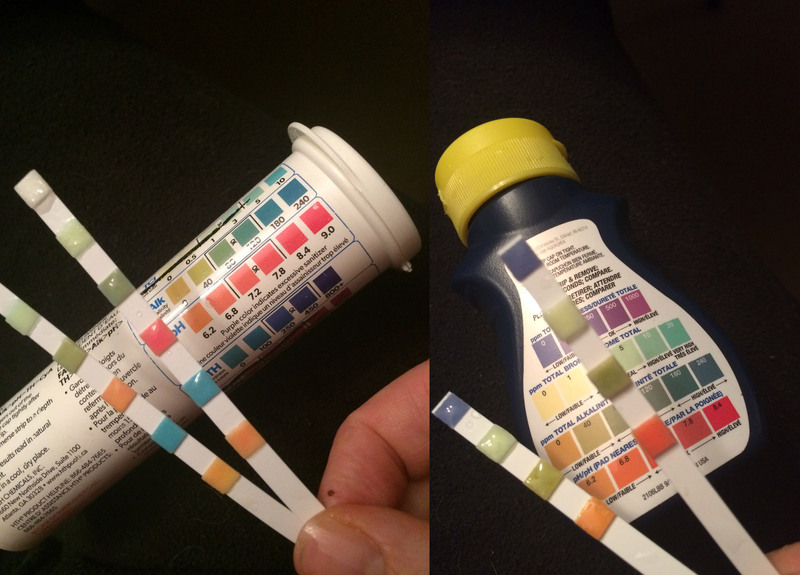 The only drawback to pool test strips is that we are required to just read out those that pertain to freshwater systems: pH, hardness and alkalinity. You have to ignore the rest. It’s a small price to pay for a little bit of accuracy! While it’s better if you can do a titration (chemicals!) or use a calibrated meter, you can still find some basic readings with some simple test strips for a pool. Here they are in order from worst to best! Filtering the map, Regions, Gamification and data downloads!